An infinitely-adjustable, insulated side pocket for any size water bottle from 0.5L to 1.5L. This SIDE POCKET ECHO is an infinitely-adjustable insulated water bottle pocket. It will securely hold anything from a small 0.5 liter size, up to a huge 1.5 liter size. The pocket can be adjusted to exactly the size of any container in that range. 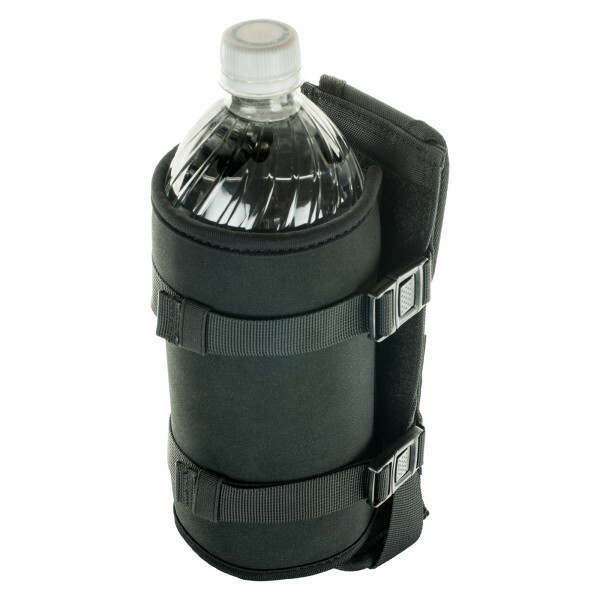 It takes the form of a neoprene sleeve that wraps around the water bottle and it secures with two clips on two straps. It makes for a perfect fit, regardless of the the size of the bottle, and it allows one-hand removal and replacement of the bottle.